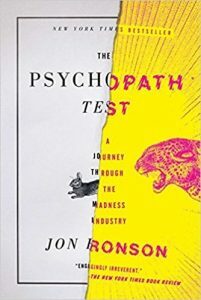 The Psychopath Test by John Ronson explores the shortcomings of psychiatry and the elements of human error in diagnoses. There is A Psychiatric Label For Everything! It’s difficult to summarize The Psychopath Test because it’s the story of author’s own research into psychopathy. But it does not reach any conclusions or make any points based on research or on an overview of the literature. Before the Hare Psychopathy Checklist labeling someone a psychopath or not was fully up to the medical personnel. And they would often got it wrong. Hospitals for example admitted for treatment as psychopaths several healthy individuals who only wanted to prove that the system couldn’t really tell people apart. When the experiment was revealed, the psychiatric world was shocked. One hospital then said to send more healthy people posing for psychopaths and they would recognize them. They indeed recognized more than 40. The problem was, no healthy individuals were purposefully sent. That’s what the the Hare checklist wanted to provide: a standardized way of assessing patients that would eliminate (or reduce) human judgement. The author reviews a few “grey area” cases and shows the limitation of the Hare’s checklist. The Hare Psychopathy Checklist is the instrument psychologists and psychiatrists use to assess and “label” people as psychopaths or not. It turns out, a checklist might not be such a great tool and is very prone to human judgment. And human mistakes. The author makes the point that we used too many drugs. Sometimes for people who have issues that might not necessarily be the symptoms of a psychiatric issues. But, he says, the DSM has so many entries that almost any behavior could be labeled as a mental illness. Jon Ronson also goes into corporate and psychopathy. If I remember correctly at one point the book either claims or suggest that “the higher you go, the more psychopaths you meet”. The author interviews one of the most ruthless CEO corporate America has ever seen, Albert Dunlap. I didn’t think that was a good example at all though, since Dunlap ended up in a big crash and burn. So if everyone psychopath were like Dunlap, they’d soon exterminate themselves. The book has been criticized for its lack of scientific rigor and for the sensationalism it seeks to create. The title by itself “a journey through the madness industry” is sensationalist. “Madness”? “Industry”? Most of all, I invite you to read Bob Hare’s reply here. It’s an instructive -and even entertaining- read. That being said, I have to add my own critique to the critique: Hare complaining that his checklist is “copyrighted material” is freaking ridiculous. If he is about spreading knowledge, he should share that stuff for free. Diagnoses, often, are nothing but a personal opinion which leverages experience, research and maybe a checklist. But they still keep that personal opinion in the mix. Watch out especially for your own self-diagnoses, as they tend to be particularly poor. The author quotes the book The Sociopath Next Door. However, the messages from these two books are very different. The Sociopath Next Door makes the point that it’s sociopaths who want you to believe that everyone can do anything. And blurring the lines of “good” and “evil” only serves the sociopaths. I side with Martha Stout here: There are evil people. And good and evil doesn’t overlap nearly as frequently as romanticized novels would want you to believe (also read “Do Good and Evil Overlap“). The Psychopath Test might has well have been called “A Random Walk in Psychopathy”. If felt random to me, without a single threat that would unify the different parts and chapter. At the end of the day, if someone were to ask me “what’s this book about”, it would take me a long winded answer which would say a lot while at the same time saying little. I don’t think that’s a good thing because books like this usually leave me with little takeaways. As Ronson interviews a famous financial operator, he tries to score him on the Hare checklist. But he does so in a light and shallow way. I didn’t really get the point The Psychopath Test was trying to make. I listened to the audiobook and I failed to understand the author’s point and to take away much from the book. At the end of the book, I didn’t feel I ad learned too much of either sociopathy, psychopathy or mental illnesses in general. Except, maybe, that labeling is difficult and possibly prone to lots of mistakes. That, by itself, can be a major takeaway though. I think indeed the author was trying to somewhat discredit the psychiatric profession, but he falls short in exactly admitting it. That is what I missed from this book: a clearer stance from the author. Even if his stance ended with a “I’m not sure”, he should have been clearer about it in my opinion. If you want to understand psychopathy, this book is not for you. If you want to read a more journalistic, captivating book on psychopathy and the issues around the mental illness, then go for it.